It is Earth Hour this evening - the annual call to turn off the electric lights and gadgets for an hour after it gets dark as a small gesture to helping the environment. Tonight I'll be joining in with Earth Hour, but I thought I'd also do something environmentally friendly during the day. I'd seen a meme going around on Facebook showing egg shells being used to grow plants from seeds. 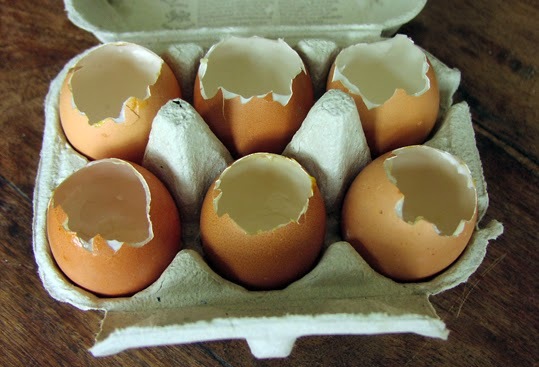 Seeing as I've been enjoying boiled eggs with bread-and-butter soldiers for my lunch recently, I thought I'd save up the egg shells and have a go. I carefully washed out the shells and popped them back into the egg box. Then, I nearly filled them with compost from my own garden, popped a couple of seeds for bee-friendly flowers in each, put more compost on top and gave them a watering. They are now sitting in my window sill. Hopefully some seedlings will grow from them and I'll be able to plant them out in the garden to help the bees. 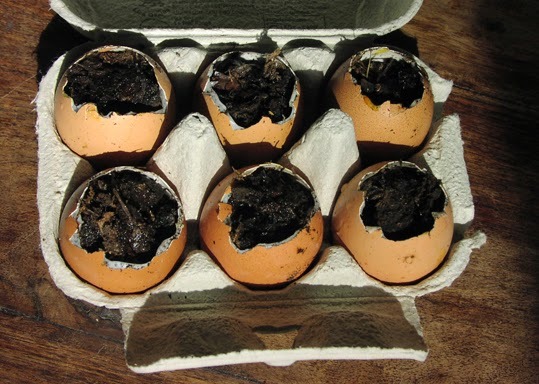 Egg shells also make great containers for seed bombs, if you fancy a little guerrilla gardening as an Earth Hour activity. I would recommend using a small amount of wet clay to seal the open top of the egg though, unless you are very good at keeping an egg box upright while carrying it around.